You might not even think that your driveway or a walkway matters to the appearance of your home, but it sure does. It’s one of the first things that family and friends notice and it’s also something that welcomes you home. 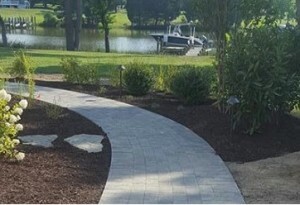 A custom driveway and walkway from F.A. Hobson Landscaping can be created with a variety of materials and we can add unique patterns to add beauty and style. A paver driveway is also great for drainage and will last a very long time.